What can President Obama do about gun violence? Following a school shooting in Connecticut, the pressure is on US President Barack Obama to act on gun control. The White House said Tuesday that Obama supports renewing a federal ban on assault weapons, but what other options does Obama have? In the wake of the Connecticut school shooting that sent the US reeling last Friday, President Barack Obama swore to “use whatever power this office holds” to prevent such tragedies in the future. The White House said Tuesday that Obama plans to support a reinstatement of a federal ban on assault weapons, a move that suggests a significant shift for a president who, during his first term, moved gun control to the bottom of his list of priorities. In the days following the massacre, pressure from Democrats has indeed mounted on Obama to take action. After all, they say, he is no longer up for re-election and therefore does not have to worry about appealing to the pro-gun wing of the party. Beyond the political sphere, there has also been a swell of outrage from the public; a petition on the White House website demanding stricter gun laws has been signed by more than 150,000 people (a record), and polls conducted after the shooting show a majority of Americans favouring tighter regulations -- including a ban on semi-automatic weapons. The consensus this time seems to be that Obama has no choice but to try to follow through on his promise -- and that his heart is in it. "President Obama seems very likely to shoot for the moon on this," said Thomas Mann, a political scientist at left-leaning thinktank the Brookings Institution. "I think It is a moral imperative for him to act boldly, and he appears to agree." But the question looming over Obama, haunting activists and analysts alike is: what exactly can the president do? Both parties have resisted infringing on America’s widely defended “Second Amendment right” over the past several years, and the political climate is already rife with tension as Obama and House Republicans face off before the impending fiscal deadline. Moreover, since the regulation of guns is a constitutional issue, Obama’s power to enact major change remains limited; he needs Congress to approve any substantive federal reforms, and the House of Representatives is controlled by largely pro-gun-rights Republicans. There are, however, “specific things he can accomplish through executive action” (without going through Congress), explained Robert Spitzer, professor of political science at State University of New York at Cortland and author of “The Politics of Gun Control”. Such measures would essentially entail more rigorously enforcing laws that exist already. “President Obama can ensure that gun registries and salespeople get better records from federal agencies that are supposed to flag individuals with known mental disabilities,” Spitzer noted. The sale of guns to felons and people with psychiatric illnesses is prohibited in America, but according to Spitzer, “some states are not consistently reporting mental health data”. An executive order requiring stricter adherence to that type of “background check” procedure could save lives, Spitzer said, as most individuals who committed recent mass shootings in the US have had known mental problems and obtained their guns legally. Obama and his attorney general, Eric Holder, had already mapped out steps to take without Congressional approval after the shooting of Representative Gabrielle Giffords of Arizona in 2011. But the proposals were dropped as Obama’s favourability ratings flagged in the year leading up to his fiercely fought re-election. “The president has shied away from the issue, even when he took more progressive stances on social issues such as gay marriage and reproductive rights,” said John Fortier, a political scientist at Washington think tank Bipartisan Policy Center. The principal obstacle standing in Obama’s way is Congress, since any new reforms would require Congressional approval. Obama plans to push Congress to reinstate the Federal Assault Weapons Ban, signed in 1994 and which expired in 2004, banning the possession of certain assault weapons as well as large-capacity bullet clips (any gun holding more than 10 bullets). Obama’s press secretary, Jay Carney, told reporters on Tuesday that Obama supports Senator Dianne Feinstein's efforts to reinstate the assault weapons ban and would back legislation that closed loopholes in gun-show sales. Democratic senators plan to bring the law on assault weapons back for a vote in January. 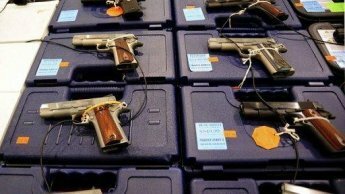 But given the Republican-controlled House, Obama might have better luck focusing on reinstating just part of the law – the restriction on large-capacity bullet clips, for example – rather than a sweeping ban on assault weapons, Spitzer said. Pro-gun Democrats like Senator Joe Manchin of West Virginia and Representative John Yarmuth of Kentucky spoke out in favour of gun control on Tuesday. “I have been largely silent on the issue of gun violence over the past six years, and I am now as sorry for that as I am for what happened to the families who lost so much in this most recent, but sadly not isolated, tragedy,” Yarmuth said in a statement.